Preview Videos - Lens Studio by Snap Inc.
A Lens preview video helps users visualize your Lens experience before unlocking the Lens. Think of it as a mini trailer for your creation. Previews make your Lenses more compelling and will be visible to the public. There are two ways to add a Lens preview video, through the Project Info settings or My Lenses submission process. 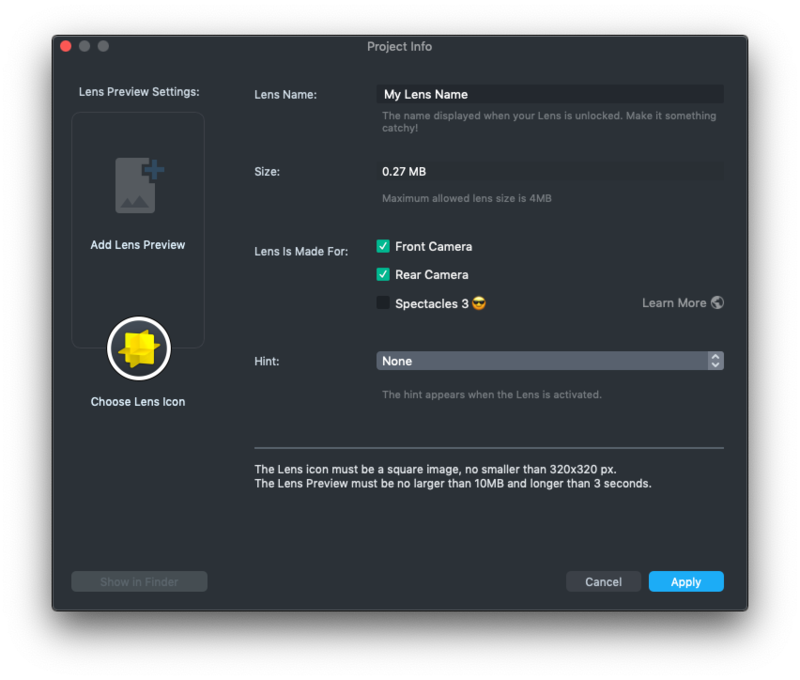 If you click on the Project Info button in Lens Studio's toolbar, you will see various settings to configure your Lens Project. Click on Add Lens Preview and pick a pre-made video to apply your Lens to. 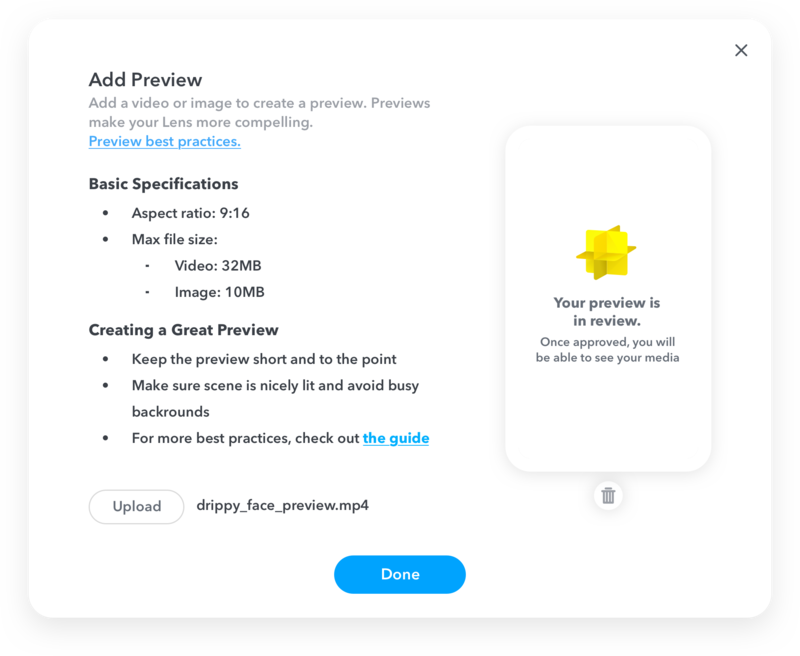 You can also upload your own preview videos. 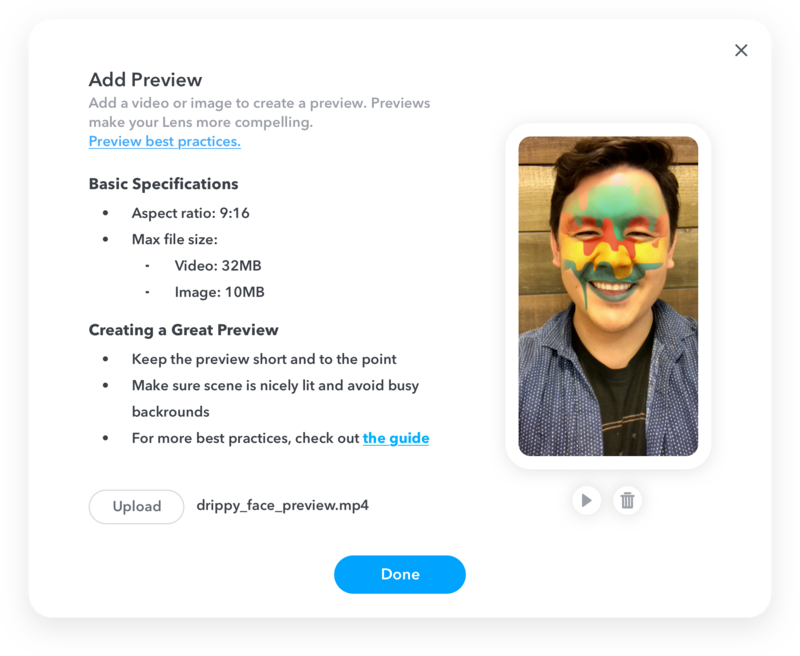 This gives you a quick and convenient way to create a preview video for your Lens! For more information about the Project Info window, please refer to the Configuring Project Info guide. You can also submit your Lens preview during the Lens Submission process. After pressing the Submit button, you'll be taken to the Confirm Submission page. There, click the Add Preview button. This will take you to the Add Preview window. Click the Upload button to add your preview. Once uploaded, the preview video will go into review. The message Your preview is in review will show until the preview video is approved. Once the preview has been added, click Done. If you have added your Lens preview in the Project Info, there is no need to add another one. Since one Lens can only have one preview, adding another preview video here will replace the one you added earlier in the Project Info. You can always submit your Lens and add the preview video later. This also applies to any Lenses submitted before the preview video functionality was added. To add or update a preview video after submission, first open My Lenses by selecting Menu Bar -> Window -> My Lenses. Then, find your Lens entry and click the ... button. In the selection pop-up, select Manage Preview.